You can access Quick view control properties in solution explorer. Under Components, expand Entities, expand the entity you want, and then select Forms. In the list of forms, open the form of type Main. Then on the Insert tab, select Quick View Form to view the Quick View Control Properties page. Name Required: The unique name for the quick view form that is used when referencing it in scripts. Label Required: A label to display for the quick view form. Display label on the Form Displays the label on the form. Lookup Field Choose one of the lookup fields included in the form. Related entity This value depends on the Lookup Field you choose. It is usually the primary entity for the 1:N entity relationship for the lookup. If the entity includes a Potential Customer lookup that can accept either an account or contact, in the Quick View Form field you can choose a quick view form for both account and contact by changing this value and then choosing another quick view form. 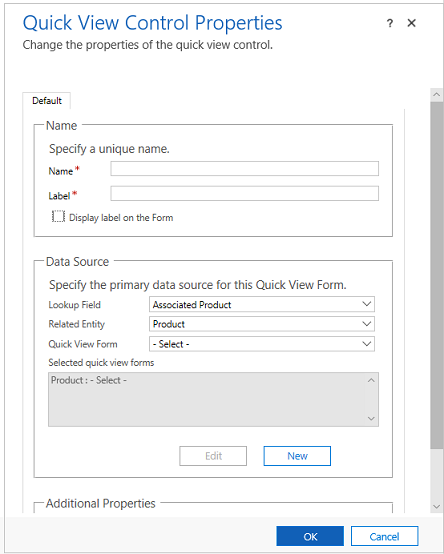 Quick View Form If the Related entity has any quick view forms you can select them here. Otherwise, select New to create one. Select Edit to change the selected quick view form. Additional Properties You can specify the default rendering style by selecting the check box.